One of the boy's favorite summer activities has been participating in Challenger Sports' British Soccer Camp. This year marks the fourth year he has been able to attend the program and, once again, we very much enjoyed the camp. In British Soccer Camps, young coaches from England come to the US for the summer in order to teach soccer camps to American youth. Most play higher level soccer back in England so they are full of energy and ready to teach the game to American kids. Camps are tailored to all ages, from 3-5 year olds up through high school, and include mini camps, half days, and full day camps, depending on your area. They even have specific camps for goal keepers. We lucked out and there was an evening half-day camp in our neighborhood. It's perfect for us and it was actually walkable. Each day of camp has a different theme, as the kids divide up into "World Cup" teams to compete in fun challenges. This year, they decorated their soccer balls, dressed in team colors, and a few other things. They also spent a lot of time working on specific soccer skills. With an upper middle schooler who plays defender, I appreciated them spending time on skills he could use. Of course, they played plenty of scrimmages, to put those skills to the test! 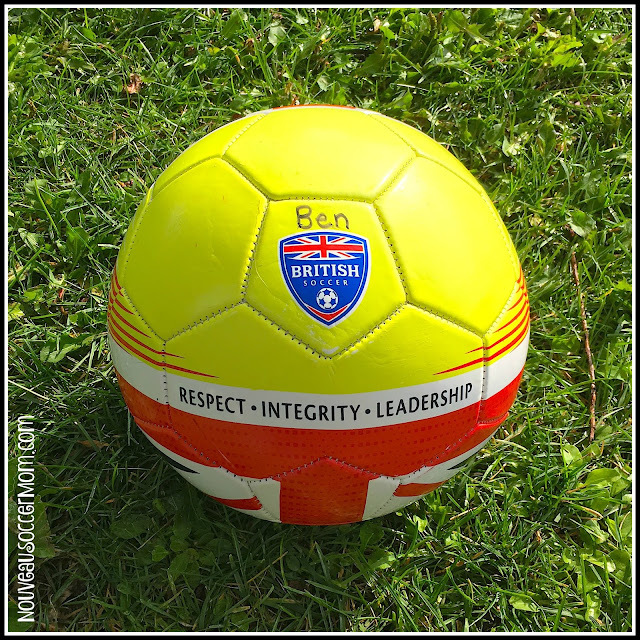 With year 4 wrapped up, we're already looking forward to year 5 with British Soccer Camps. Until then, it's fall soccer season!